(AP) STATE COLLEGE, Pa. - Paternoville will now be Nittanyville. The Penn State student group that manages the area outside Beaver Stadium where students camp out for prime football tickets has changed the name of the tent city that spouts up the week before home games in Happy Valley. The also-renamed Nittanyville Coordination Committee said Monday that student officers decided the name change would "return the focus to the overall team and the thousands of students who support it." Late coach Joe Paterno was fired in November soon after his former assistant, Jerry Sandusky, was charged with child sexual abuse. Sandusky awaits sentencing after being convicted last month of abusing 10 boys. He has maintained his innocence. An independent investigation led by former FBI Director Louis Freeh released a report last week that concluded Paterno and other top Penn State administrators concealed Sandusky's abuse to shield the university from bad publicity. 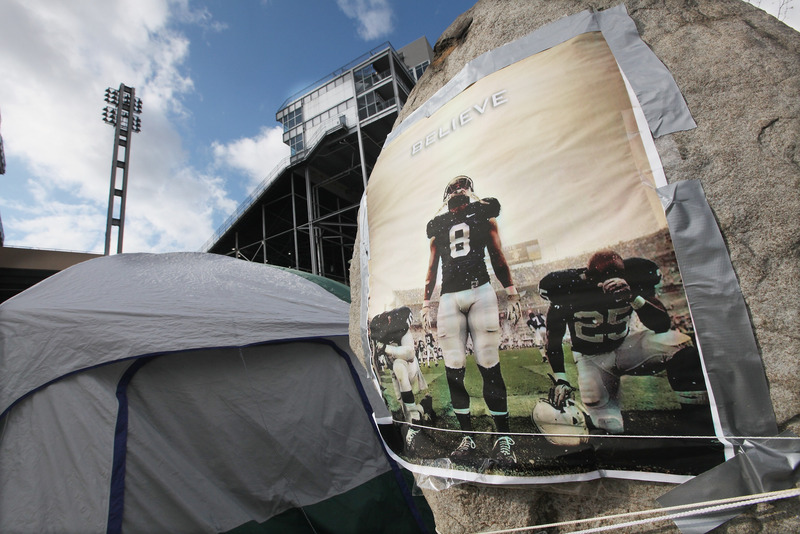 On its website, the student organization that runs makeshift campgrounds said that "since it was unlikely another coach would stay as long as Coach Paterno had, changing the name for each new coach would be impractical." "Now, it's a new era of Nittany Lion football," committee President Troy Weller said in a statement released Monday. "And by changing the name to Nittanyville we want to return the focus to the overall team and the thousands of students who support it. We thank the Paterno family for their gracious assistance and support over the last several years." Students at this year's encampment plan to donate some fundraising proceeds to a child abuse prevention and treatment center. The tent city was dubbed Paternoville in 2005, and the student organizing group became an official university organization, recognized by the office of student affairs, the following year.